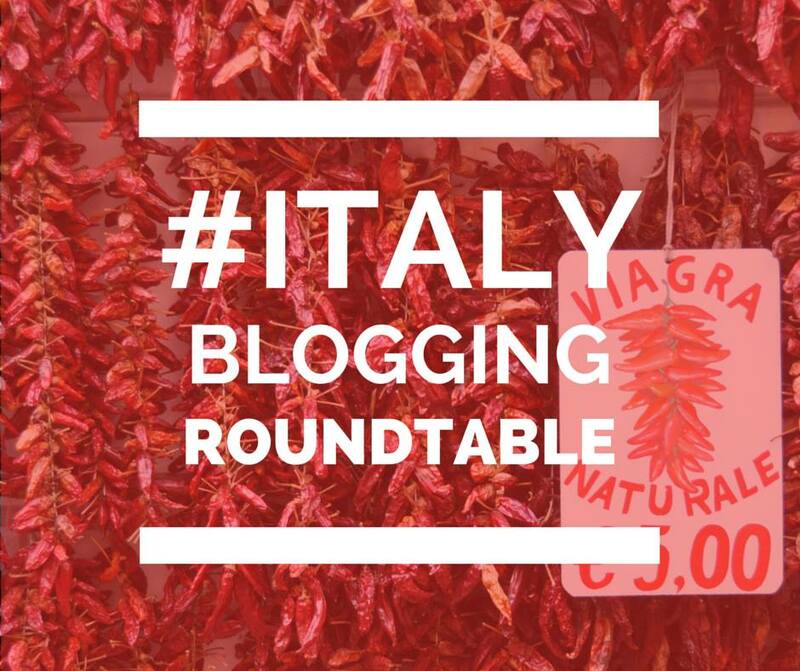 Our monthly Italy Blogging Roundtable theme this month is “My local…”! Take a look at posts by Kate Bailward, Jessica Spiegel, Melanie Renzulli, Alexandra Korey, Gloria, and Michele Fabio. (If you missed the previous months, take a look here.) Welcome back to our table…come pull up a chair and join in on the conversation. Sometimes I feel like I have lived through the 1970’s twice. Even the larger stores were local chains. Our grocery store of choice was Honiotis Bros. because, you know, Greeks. (The Xoniotis family, who became the Honiotis family, was from Mykonos like our Theodosis and Vardoulakis – now Vardal – families, so we bought our carrots and toilet paper from Honiotis’ out of national pride.) But sometimes we would make a big trip to Dominick’s, which was a local chain. If we had to stock up on school clothes, it was off to to Wieboldt’s or Goldblatt’s (Wieboldt’s was better, because they gave out S&H Green Stamps), but a family wedding merited an excursion to Kline’s or The Boston Store. We loved The Boston Store, because the name conjured up that sophisticated and exotic city on the East Coast. And then things started to change, and we all know how. First it was large supermarket chains that offered unbeatable prices during the recession, then it was newfangled malls that replaced the main streets for teenagers and adults alike. Not long after, the first big-box stores appeared, funneling business from the locally owned shops, and the vacant storefronts were replaced by national franchises. None of the businesses I remember from my elementary school years are still around. Honiotis went first in 1985, then Dominick’s began to falter. Wieboldt’s, Goldblatt’s, Kline’s, and The Boston Store (not to be confused with Boston Store)…all gone. Now it’s chains as far as the eye can see, and everything from the suburbs to the downtowns look pretty much the same across great swathes of the US. 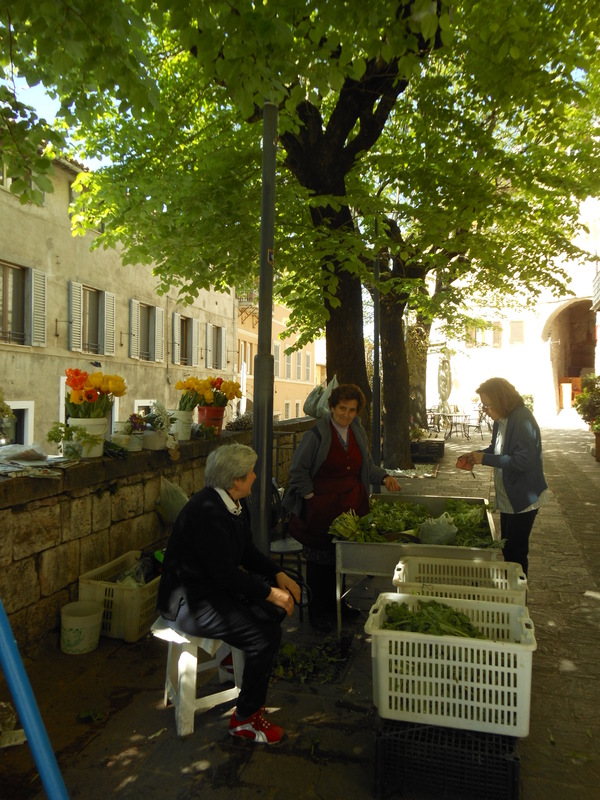 When I first came to Umbria in the mid-1980’s, in many ways it resembled the US a decade or two before. Franchises and big-box superstores were virtually unknown, and the retail sector was almost exclusively small, family-run businesses. Grocery shopping was divided between the local outdoor market for produce, the dry goods store, the butcher, and the bread shop. Buying a pair of black pants meant stopping in at one or two central emporiums, announcing that you needed black pants, and trying on whatever they brought you from the shelves. It was more time consuming and less efficient, but also more human and kept residents living in the otherwise inconvenient confines of the town centers. Unfortunately, the same process that tore the fabric of American downtowns twenty years before began taking hold in Italy shortly after my first trip. The convenience and competitive pricing of supermarkets began to squeeze out the tiny markets and food shops, the novelty of the mall trumped the fustiness of historic clothing stores for younger customers, and the powerhouse marketing of national and international franchises crushed local shops. I have watched in dismay over the past two decades as more and more local businesses struggle while Foot Locker, H&M, and even the Italian chain Intimissimi seem to multiply overnight like mushrooms. Though, in my heart of hearts, I long for an Ikea, I also have seen (twice!) the damage this modern franchise culture can do to communities and their local economies. 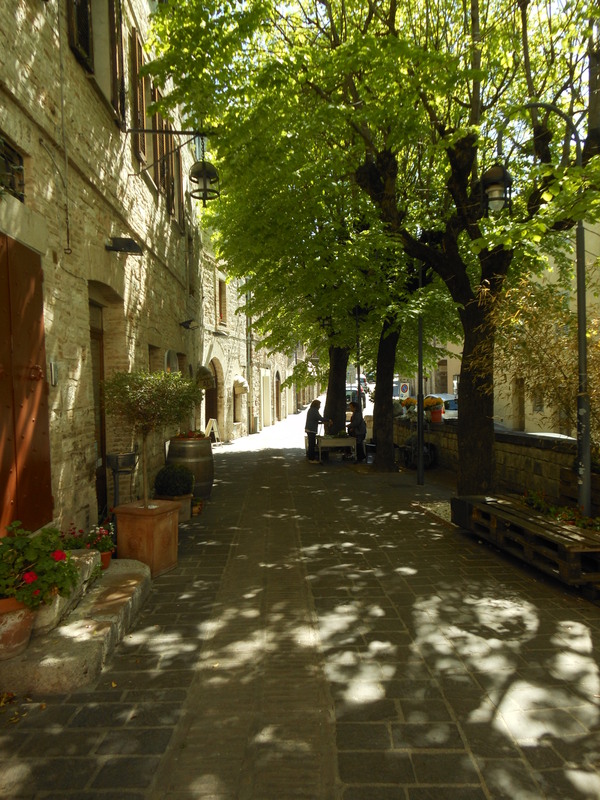 I try to limit my excursions to the mall and the sprawling grocery stores along the highway to dire emergencies, and spend my time and money in the admittedly more expensive but also charmingly timeless shops in the center of Assisi. Case in point: the Piazzetta delle Erbe. 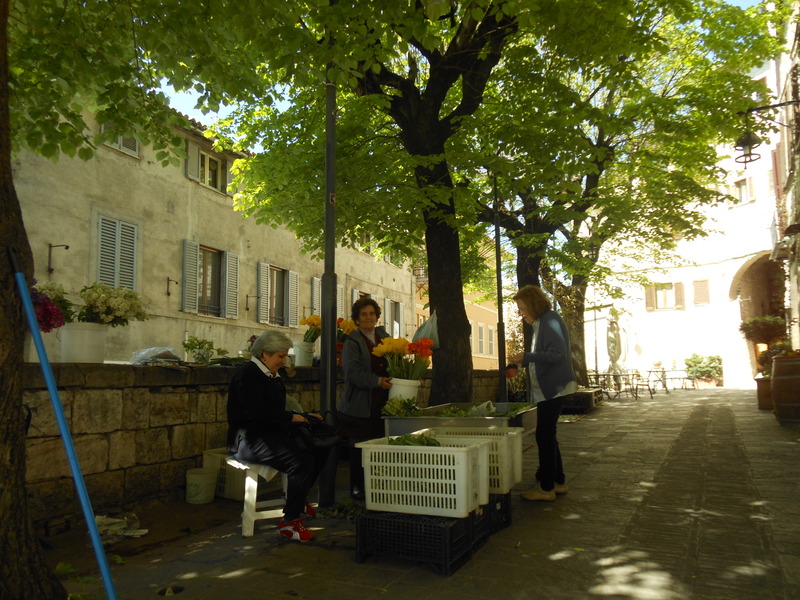 This tiny square just steps from Assisi’s main Piazza del Comune has been the local produce market for decades, if not centuries. Certainly long enough that the spot was officially dubbed “Greens Square” at some point and is now home to an excellent restaurant of the same name. The home I stayed at on my second trip to Assisi in the late 1980’s had rooms overlooking this square, including my bedroom. I would wake to the friendly squawking of the local ladies bargaining for everything from potatoes and tulips each morning, mixed in with local gossip and good natured ribbing. 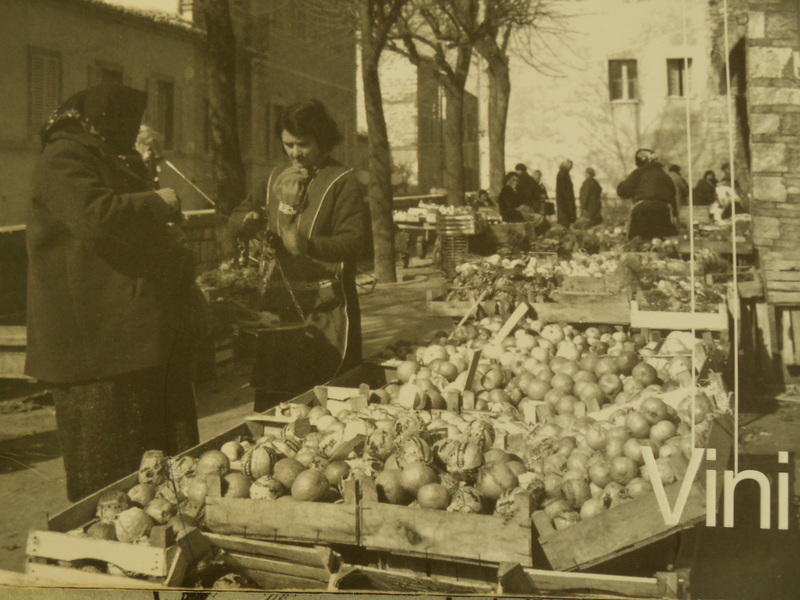 The Piazzetta delle Erbe was both market and meeting place, and the small space was crammed with makeshift stands and tables, three-wheeled Apes, or simply stacked crates holding towers of seasonal fruit, vegetables, fresh eggs, ricotta, honey, and anything else these farmwives from the surrounding countryside had to sell that morning. Today, just Novella remains. 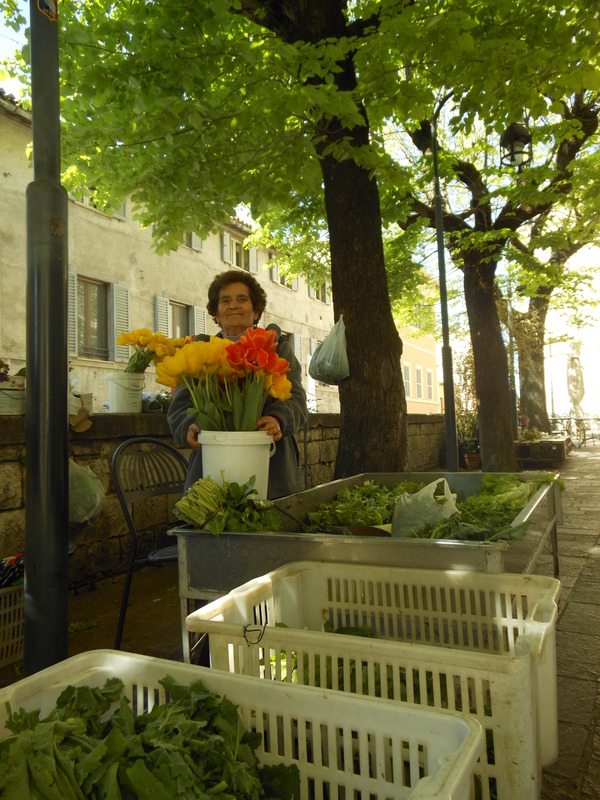 With enough energy and warmth to fill a piazza, but with just one lone stand of goodies she and her sweet husband Bruno bring in from their farm plot outside of town each morning, Novella holds court from dawn to lunchtime each day. She is almost never alone, as the local ladies take turns resting on her guest stool to swap news while she tirelessly rearranges buckets of fresh flowers, piles of greens, and crates of fruit. She holds the scales in her hand to weigh purchases, and then always throws in something extra after declaring an (often seemingly arbitrary) price. It makes be both sad and joyful to see Novella still out there every morning. “Bongiorno, core!” she calls out as I pass. She knows what each of my sons prefer, and will spend a good five minutes picking the radicchio leaves out of my mixed greens to please them. She will scoff at my selection of tomatoes, tossing them back into the pile and choosing others. “Those are for salad, cocca. You want the sugo ones,” she explains after placing what look like identical ones on the scales. She will pick out a melon with all the gravity of a Antwerp diamantaire, after inquiring about the exact time I plan on serving it. I know it takes me twice as long to buy from Novella, but I love the familiarity of it. I love being grilled by a group of housewives about my menu for the day, and then standing back as they argue amongst themselves about recipes and ingredients. I nod and smile, often feigning exaggerated ignorance just to revel in their animated conversation. 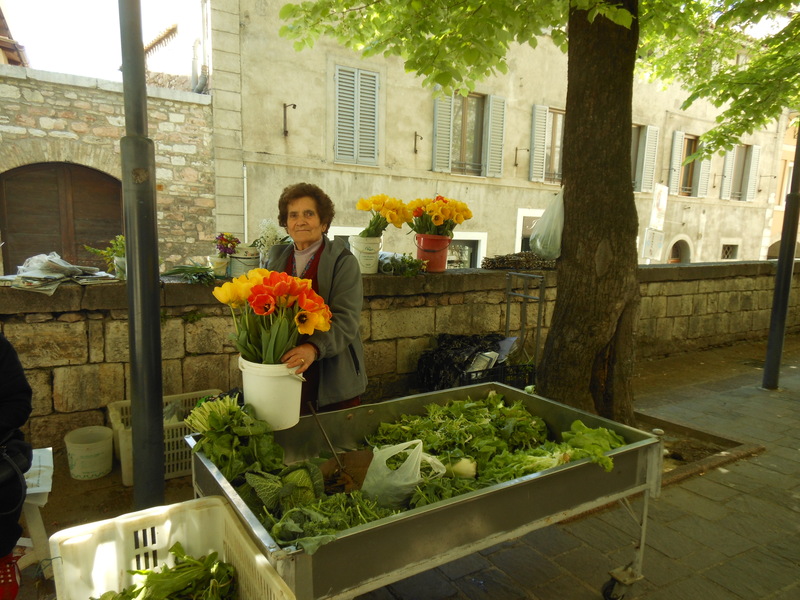 The vast Coop supermarket will be there for years into the future, but one morning soon Novella will be gone, and with her the Piazzetta delle Erbe market. And until that day comes, she’s my local go-to vegetable lady. So sad to see the small markets losing ground to the big box stores, even in Italy. I’m looking forward to our CSA share from Cape Cod Organic Farms down the street. Even though the share will be very small in the first few weeks (this being New England, where we recently had snow on the daffodils), I love buying food when I know where, how, and by whom it was grown. Love your blog! I am Italian-American and grew up in the 70’s on NY’s Long Island and Brooklyn, making the rounds with my mother – to the butcher to get the chicken, to the deli for lunch meat, and to the bakery for desserts, I’ve seen these small places largely abandoned for grocery store chains as time has gone on. But, almost miraculously, at least the farmers’ markets have reappeared in most cities and larger towns. And now I have found a real butcher who makes the farmer’s market rounds and fresh vegetables and fruit again in the summer. I am so happy to shop outdoors for this high quality food again!